OLANDA – Paradise Redefined…offers high quality, stylish furniture and home accessories made from natural materials. Materials many of which are designed and manufactured exclusively for OLANDA. 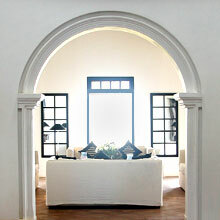 OLANDA owns a furniture store in Galle Fort specializing in antique originals and handcrafted reproductions. Ziham and Sabreena founders of this unique trade have been in this business for the last 10 years. The story begins like this. This couple didn’t stop exploring and experimenting. Clients from all over the world started visiting them as they are located centrally in the old Dutch fort (Olanda Kotuwa) in Galle and one of the clients wanted a dozen of planters chairs for his hotel in London, but it had to look exactly like the original piece. These two Sri Lankans didn’t want to miss this opportunity, the young and talented couple took up the challenge. They both realized, to get the original look the wood has to be old (reclaimed) and unique. Today, OLANDA has its own furniture factory employing 20 very skilled crafts man.